The charge periodically arises that members of the Church of Jesus Christ of Latter-day Saints are not Christians, either from individuals who are unaware of LDS teachings or from the deliberate misrepresentation of critics. Those who do know the Latter-day Saints can testify that we are not only Christians, but Christians with a broader and deeper understanding of Christ than offered by other religious traditions. The name of the Church reflects Christ's central role in our faith. Christ declared: "whatsoever ye shall do, ye shall do it in my name; therefore ye shall call the church in my name; and ye shall call upon the Father in my name that he will bless the church for my sake. And how be it my church save it be called in my name? For if a church be called in Moses' name then it be Moses' church; or if it be called in the name of a man then it be the church of a man; but if it be called in my name then it is my church, if it so be that they are built upon my gospel." Christ's church today is called The Church of Jesus Christ of Latter-day Saints, to distinguish it from the Church in ancient times. The Book of Mormon expands the Christian understanding of Christ's role considerably beyond the limited details found in the Bible, teaching that ancient prophets knew of Christ's coming many centuries before his birth, and that the resurrected Christ appeared to His disciples on the American continent and in other parts of the world. The central purpose of the Book of Mormon is "the convincing of the Jew and Gentile that Jesus is the Christ, the Eternal God, manifesting himself unto all nations." The records in the Book of Mormon help to establish the truth of the Bible. The Book of Mormon also serves as a bridge between the Old Testament and New Testament. The Book of Mormon demonstrates that Christ was not simply a local teacher of the Jews who commanded his disciples during his ministry, "Go not into the way of the Gentiles, and into any city of the Samaritans enter ye not," but God over all the earth, who loves and visits His children throughout the world. The Book of Mormon demonstrates that God is the same yesterday, today, and forever, and that He loves His children throughout the world just as much as He loved the ancient Israelites. The prophet Nephi wrote: "And we talk of Christ, we rejoice in Christ, we preach of Christ, we prophesy of Christ, and we write according to our prophecies, that our children may know to what source they may look for a remission of their sins." Any serious reader of the Book of Mormon will readily recognize Christ's central role. Susan Easton Black wrote: "Christ is the central theme on every page of the Book of Mormon ... these prophetic scribes referred to Jesus Christ by, literally, 101 different names ... The Book of Mormon prophets mentioned some form of Christ's name on an average of once every 1.7 verses. By comparison, the New Testament writers mentioned a form of his name on an average of once every 2.1 verses." Many Christians acknowledge Jesus Christ as the Savior, but are often unaware of His other roles. Latter-day Saint scripture teaches several essential roles of Christ in the Plan of Salvation, including Creator, Jehovah, Redeemer, Judge, and power of the universe. Jesus Christ is the creator of worlds. This role is alluded to in Hebrews, although taught more explicitly in the Book of Mormon. The Book of Mormon prophet King Benjamin prophesied of the birth of the Savior: "And he shall be called Jesus Christ, the Son of God, the Father of heaven and earth, the Creator of all things from the beginning." Modern revelation identifies Jesus Christ as the Jehovah of the Old Testament. Christ's role as Savior, Redeemer, and Judge are referenced over a hundred times in the Book of Mormon and Doctrine and Covenants. Christ declared: "I am the way, the truth, and the life: no man cometh unto the Father, but by me." Having triumphed over sin and death through the atonement and resurrection, Christ will bring all people to life and judgment: "And my Father sent me that I might be lifted up upon the cross; and after that I had been lifted up upon the cross, that I might draw all men unto me, that as I have been lifted up by men even so should men be lifted up by the Father, to stand before me, to be judged of their works, whether they be good or whether they be evil." John recorded the words of the Savior: "For as the Father raiseth up the dead, and quickeneth them; even so the Son quickeneth whom he will. For the Father judgeth no man, but hath committed all judgment unto the Son ... Verily, verily, I say unto you, The hour is coming, and now is, when the dead shall hear the voice of the Son of God: and they that hear shall live. For as the Father hath life in himself; so hath he given to the Son to have life in himself; And hath given him authority to execute judgment also, because he is the Son of man." The Book of Mormon teaches that Christ "doeth not anything save it be for the benefit of the world; for he loveth the world, even that he layeth down his own life that he may draw all men unto him." It also teaches a far broader application of the Atonement than that understood by most Christians. Most Christian faiths teach that individuals who do not know of Christ and have no opportunity to accept Him are damned. 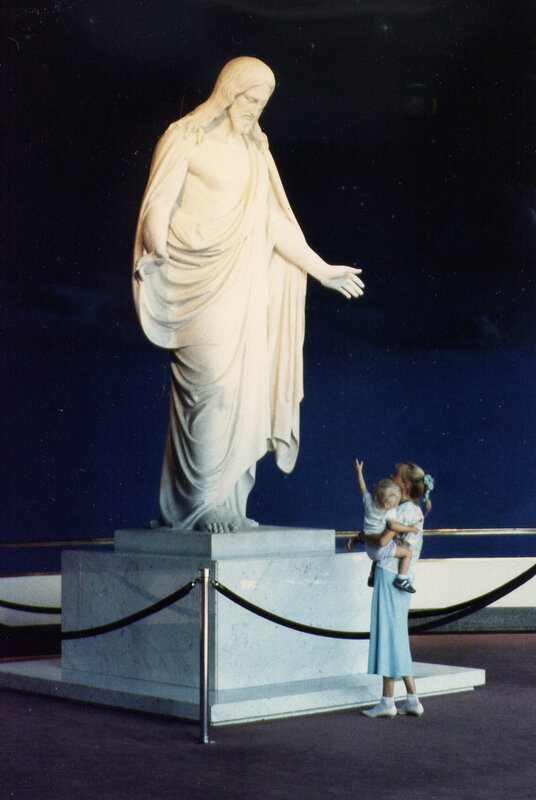 In contrast, the Book of Mormon teaches of a merciful and just Savior, whose atonement redeems not only faithful believers, but also young children and those who have sinned in ignorance without having an opportunity to accept Christ in addition to the universal resurrection that all mankind will experience. "Jesus Christ ... ascended up on high, as also he descended below all things, in that he comprehended all things, that he might be in all and through all things, the light of truth; Which truth shineth. This is the light of Christ. As also he is in the sun, and the light of the sun, and the power thereof by which it was made. As also he is in the moon, and is the light of the moon, and the power thereof by which it was made; As also the light of the stars, and the power thereof by which they were made; And the earth also, and the power thereof, even the earth upon which you stand. And the light which shineth, which giveth you light, is through him who enlighteneth your eyes, which is the same light that quickeneth your understandings; Which light proceedeth forth from the presence of God to fill the immensity of space -- The light which is in all things, which giveth life to all things, which is the law by which all things are governed, even the power of God who sitteth upon his throne, who is in the bosom of eternity, who is in the midst of all things." This passage teaches that Christ is not only our Savior, or our Creator, or our Judge, although He is all of those things. He is the very power by which the universe exists, the sun and stars shine, and the earth moves on its axis. He is the source of all enlightenment and truth. In a word, Christ to Latter-day Saints is everything. It is difficult to imagine how any faith could declare a more central or universal role for Christ than this. These teachings are not new inventions of modern Latter-day Saint theologians: they go back to the revelations of the prophet Joseph Smith in the earliest days of the restored Church. "For critics to claim that early Saints did not believe in Christ, or to imply the same by saying they believed in "a different Christ," or to suggest the same thing about us today, is bearing false witness. It's that simple. If they were at all interested in fairness, outside commentators could note that Mormons add to the four gospel accounts a visit of the resurrected Lord to the Western hemisphere as recounted in another work of scripture. They could explain that we do not accept the creeds formulated by theologians and philosophers at church councils starting three hundred years after the crucifixion. They could note that we accept other works of scripture besides the Bible and do not think God ever restricted his communication to that compilation. Such differences indeed set us apart from other Christians. But a different Christ? Those two words leave the false impression that we have anointed someone other than Jesus of Nazareth as our Messiah. Please!" Latter-day Saints worship Jesus Christ, the Lamb of God and Only Begotten Son of the Eternal Father. Claims of critics that we worship a "different Christ" can only be considered to demonstrate their own lack of familiarity with Him. Latter-day Saints are not only Christians, but Christians with a unique understanding of the central role of Jesus Christ in every aspect of our lives, and our immeasurable eternal debt to Him. Latter-day Saints have a great deal to offer the world in the form of a more profound understanding of Jesus Christ, the "Savior of all men, specially of those that believe." Title page, Book of Mormon. Black, Susan Easton. "Finding Christ through the Book of Mormon." Salt Lake City: Deseret Book Company, 1987. pp. 5, 12, 15. Bitton, Davis. "A Voice from Christmas Past." Meridian Magazine, 5 December 2006.